Our system integrates with numerous eCommerce systems and takes control of data transfers, transformations, communications and retention from the source system to the data destination. Having a system with this level of control and accuracy is valuable for allowing you to cost effectively scale your business for growth and deliver incredible customer satisfaction. 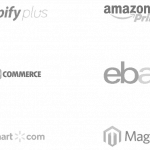 Australian Order Fulfillment is ready for integration with more than just the major platforms. We are always adding to the variety of platforms we can integrate with, this way we leave you to focus on running your primary business from the get go.